Fast food and retail workers march through Center City to kick off the campaign for "Fair Workweek" legislation in February 2018. It's one of three worker-protection laws the city will be in charge of enforcing in 2020. For the month that Ana spent selling cell phones at the Boost Mobile on Washington Avenue, she never got a paycheck. After she quit, she asked her boss for the $840 she was owed. But, she said through an interpreter, he told her he needed her Social Security number — even though Ana, an undocumented immigrant from Mexico and mother of two whose last name is being withheld because of her status, told him when she got hired that she would use her taxpayer identification number instead. Still, he refused to pay her, until Ana turned to a lawyer for help. Ana’s experience is common, said her lawyer, Seth Lyons, of Community Legal Services. Thousands of low-wage workers in Philadelphia are victims of wage theft — for example, according to a 2015 report from the Sheller Center for Social Justice at Temple University’s law school, more than 36,000 workers every week don’t get paid minimum wage. And employers who violate wage laws often think, incorrectly, that employee protections don’t extend to undocumented immigrants. What’s not common is how Ana eventually got her money: with the help of the city’s labor enforcement office. In the summer of 2016, the city’s wage-theft law went into effect. It was designed to crack down on wage theft — workers not getting paid for overtime or employers taking a portion of workers’ tips, for instance — by increasing the penalties for scofflaw employers. In the spring of 2015, after a three-year battle, the city began to implement another worker-protection law: paid sick leave. Both laws, championed by Council member Bill Greenlee, aimed to protect some of the city’s most vulnerable workers. But since then, the three-member enforcement unit, housed in the Mayor’s Office of Labor, has not seen much use. In about three years, from 2016 to 2018, it received 67 complaints regarding wage theft and paid sick leave, according to data from the mayor’s office. Out of 24 wage-theft complaints, three — including Ana’s — were resolved. Of the 43 paid sick leave complaints, nine were resolved. The rest couldn’t be resolved for a number of reasons: The city couldn’t get in touch with the worker who filed the complaint, the employer never responded to a request for more information, or the complaint was invalid. A line cook and dishwasher who spoke to the city through a Spanish interpreter whose employer, a Fairmount pub, stopped paying him after five months, resulting in more than $1,700 in unpaid wages. Six months after his initial complaint, he got a settlement of nearly $2,000. A food worker whose employer, a supermarket in Rhawnhurst, wasn’t giving employees paid sick days. Three months after the initial complaint, the supermarket gave the one worker $188 in retroactive pay. A server and cashier at a university whose employer, a food service company, wasn’t giving workers paid sick leave. In that case, the worker was not covered by the law because the person was a member of a union. Out of the nine wage-theft complaints that included data on the amount stolen, the average was $1,000. One-quarter of the paid sick leave complaints were from health-care workers, including a paramedic, a hospital receptionist, and a nurse. In the 12-month period ending September 2018, the city received about 200 inquiries — workers or employers asking anything from whether they’re covered by the law or if they have to change their employee handbooks. By comparison, Seattle’s Office of Labor Standards, considered one of the national leaders in this sort of enforcement, resolved 76 paid sick leave investigations and 62 wage-theft investigations in 2018 alone. That year, Seattle, which is smaller and wealthier than Philadelphia, received more than 2,000 inquiries. “The minimal enforcement of the wage theft and paid sick leave laws to date is due not to a lack of commitment by this administration, but a lack of resources,” Rich Lazer, deputy mayor for labor, said in a statement. Lazer said his office has been developing a plan over the last year to improve enforcement, including the hiring of a new director in December. 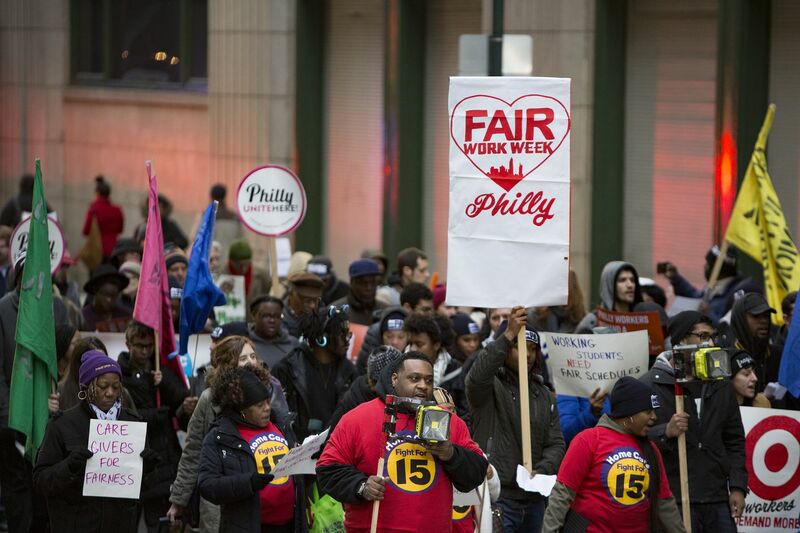 As Philadelphia turns to more workplace laws to fight poverty, such as the recent adoption of the city’s “Fair Workweek” scheduling law for retail, hotel, and fast-food workers; a $15 minimum wage for city contractors and subcontractors; and a potential “Bill of Rights” for domestic workers, attention to enforcement has become increasingly important. Often forgotten after the initial push for a law, enforcement is now one of the main issues that two progressive coalitions — the Alliance for a Just Philadelphia and MLK Dare — are campaigning for during this season’s primary. And there are signs that the city’s enforcement office will improve, pushed in part by organizers and advocates working to ensure the laws they’ve won have teeth. Lyons, Ana’s lawyer, first tried to resolve the issue by sending a letter to Ana’s former employer, demanding that she get paid. Lyons followed up with a phone call, saying his next step would be to file a complaint with the city’s enforcement office. After five months, he filed a formal complaint with the city in September 2018. Five days later, the city contacted the employer, requesting Ana’s time sheets and Boost Mobile’s employee agreement, city records show. Shortly after, Lyons said, Ana’s employer settled, paying Ana about $250 in penalties on top of the $840 she was owed. That, Lyons said, is a perfect example of how the enforcement office should work. Even small actions, such as requesting documents (rather than, say, threatening to pull a business permit), are often enough to get an employer to settle. The settlement, between Ana and her former employer, was also preferred for Ana because she didn’t have to take her complaint through the court system, a path that undocumented immigrants often fear because it becomes a matter of public record. It’s important to create a process that makes undocumented workers feel safe coming forward, Lyons said. Sprint, which owns Boost Mobile, did not immediately respond to a request for comment. In an interview last fall, Manny Citron, chief of staff to Lazer, said the office has grappled with many tough issues in its start to address enforcement. The city has also made some changes to improve enforcement, including amending the wage-theft law in March 2018 to ensure the city would be able to pursue cases related to the state’s wage law. While those amendments were being developed, the enforcement unit was referring its wage theft cases to the state. For the city, enforcement is a last step, Lazer said. Educating employers about the laws is the office’s primary goal, he said, adding that most businesses that violate the laws do so because they don’t even know the laws exist. The new director of the enforcement unit, Amanda Shimko, says she’ll prioritize education and outreach, to both businesses and the vulnerable communities these laws are meant to serve. A lawyer who most recently enforced union contracts in her role at the Pennsylvania Association of Staff Nurses and Allied Professionals, Shimko hopes to partner with groups that are already serving these kinds of workers. It’s a model that has been proven by Seattle’s Office of Labor Standards, a team of 28 that currently enforces eight protections and spends 40 percent of its $6.6 million budget on contracts with community groups for education and outreach. Philadelphia’s own office, which also enforces the city’s prevailing wage law for city contractors, had a 2019 budget of $740,000. (This number accounts for salaries of Lazer and Citron, who work across the entire Mayor’s Office of Labor, not just the enforcement unit.) Mayor Jim Kenney is proposing an increased budget of nearly $996,000 in 2020 to cover the cost of Fair Workweek implementation. Some, like Council member Helen Gym and the Alliance for a Just Philadelphia coalition, have called for a new office, separate and apart from the Mayor’s Office of Labor, that would solely enforce worker protection laws. The Pennsylvania Domestic Workers Alliance is suggesting an enforcement board comprising workers and city officials as part of its proposed domestic workers’ bill of rights. And OnePA, which led the charge for Fair Workweek legislation, is setting its sights on enforcement as its next campaign. It’s an acknowledgment, as OnePA organizing director Cecily Harwitt said, that if there isn’t political pressure to enforce worker legislation, it doesn’t usually get enforced.